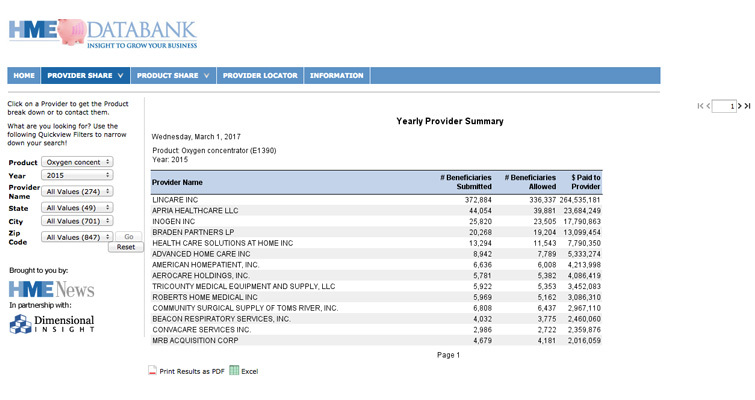 PROVIDER SHARE is a database of the top 1,000 HME providers, as measured by total Medicare reimbursement, in 288 key product categories. For 2017, users can track reimbursement information for more than 14,808 unique home medical equipment providers, representing roughly $3.37 billion in total reimbursement. The data to drive your business forward! The HME Databank has the data you need to make knowledgeable decisions and move your business in the right direction. Determine your market share and track competitors with the most comprehensive database of Medicare statistics available.The HME Databank has the most current data available from CMS—2017. You can download Medicare data in two formats, PDF or Excel. This means you can manipulate and sort the data any way you need. Your 12-month subscription gives you unlimited access to this powerful resource.